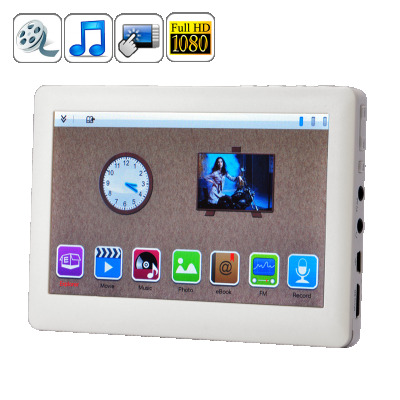 Successfully Added mediaPad - 5 Inch 1080P HD Touch Screen MP4 Player (8GB) to your Shopping Cart. Introducing the mediaPad 5 Inch 1080P Touch Screen MP4 Player, designed to meet your every expectation. Featuring amazing high-definition video playback on a crystal clear 5 inch touch screen, the mediaPad makes watching your favorite movies on the go a lot more enjoyable. High-definition movies, music, and e-Book reading on the go has never been better (or easier) than with the mediaPad MP4 Player. With a beautiful 5 inch touch screen, high-definition 1080P video playback, and a wide range supported file formats, the mediaPad is the perfect media companion for any occasion. But what sets this amazing MP4 player apart from the iPod Touch, Zune, and all of those other "name brand" players? Crystal Clear Video Playback: You won't have any trouble watching your favorite high-definition movies and TV shows on this MP4 player thanks to the mediaPad's full 1080P HD playback. Everything is displayed in crisp and clear detail on the high resolution screen, making your viewing experience absolutely perfect. Superior Video/Music Selection: With the mediaPad MP4 Player supporting today's most popular file formats (including RM, RMVB, AVI, DIVX, MKV, MOV, HDMOV, MP4, M4V, PMP, AVC, FLV and many more), you don't need to worry about file conversion and compatibility, just transfer your files and start enjoying your favorite videos in amazingly high quality! No Software Necessary: With the mediaPad MP4 Player, there is no proprietary software necessary or DRM restrictions to worry about. Simply load your files onto the player with a simple USB connection to your computer (like you would a USB flash drive) and you're good to go! No iTunes software or anything else needed! The mediaPad is the best bang for your buck from an MP4 player and includes tons of special features that simply can't be compared to. Why pay 5x more for an iPod Touch, Zune, Arcos and all of those other "name brand" players when the mediaPad is the same thing, but cheaper! Available in our warehouse now, order today and we will express ship it tomorrow, guaranteed! Brought to you by the leader in wholesale electronics and media players - Chinavasion. How do I put my music on this MP4 player? You can use the USB cable to load music from your computer directly on to the player. Does this device have a speaker? Yes. You can listen to audio with the built-in speaker or even through earphones. Besides the factory direct budget price, this MP4 Player is easy to use and plays a wide selection of popular music and video file types that is impossible to find in any other PMP in the market today. Plus, it includes full 1080P high definition playback for tons of files!